It was tight as both teams traded buckets continuously for much of the quarter with both also playing hard on the defensive end of the floor and using plenty of energy. The tide would turn quickly at the 4:26 mark as the Warriors went on a 10-0 run to go up 19-11. The Hawks went on to cut the lead to five but Waterloo was the team carrying momentum into the second quarter. After pushing the lead to seven early, the Warriors lost their momentum fast. 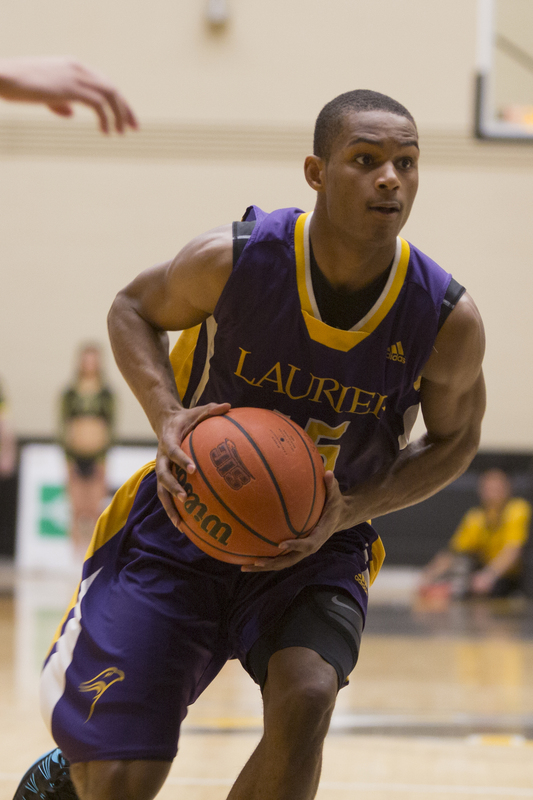 Going on an 8-0 run, Laurier then found a little bit of a groove. The rest of the quarter was a battle as both teams were going back and forth, as Laurier played with plenty of pace and energy while Waterloo played with plenty of hustle and good ball movement. Off a buzzer-beating jump-shot by Ntore Habimana, the Hawks went into halftime up 40-38. With four guys finishing with 15+ points, the standout performer besides Tevaun Kokko was Ntore Habimana scoring a career-high 19 points and getting it done on both ends of the floor. Coming out of halftime, it seemed like Laurier got the break they needed. Throughout the quarter, the Hawks found their stroke showed off their offensive firepower, scoring 34 points in the third quarter alone, nearly matching their total for the first half. With plenty of balance offensively and their fast pace, they were making the Warriors pay as well as tiring them out as the Hawks went into the fourth quarter up 74-61 off Tevaun Kokko’s buzzer-beating three-pointer. “After the first quarter, we talked about it, our pace, being able to go back and get out in transition,” head coach Justin Serresse said. In the fourth quarter, Laurier showed its prowess as they kept the Warriors at a distance. Continuing to play different starters throughout the quarter, the Hawks kept their foot on the gas regardless of their continuously increasing lead. Through plenty of composure and energy in a heated game, including the officials, Laurier pulled out the win with the final score being 97-78. “Well clearly, you saw the energy. You saw the pace, we were on the glass, we were trying to stay composed even though the foul count didn’t really go our way,” Serresse said of his team’s effort. “I think it’s his career-high if I’m not mistaken. Again, that’s the Ntore I know. I told him, ‘from now on, you play like that moving forward, there’s no way you can’t be out there playing like that every time, at least with the effort,’” Serresse said in praise of Habimana’s performance. Next up will be the number two ranked Brock Badgers who will present quite the challenge on Jan. 31 as they will face off against the Hawks at the University of Waterloo Physical Activities Complex (game has been moved due to the closure of the Athletic Complex).